The folks over at Blaster Labs managed to get some surprisingly advanced info on a couple of new dart guns that Zuru will be adding to its X-Shot line in the fall of 2015—a full year ahead of their official release. 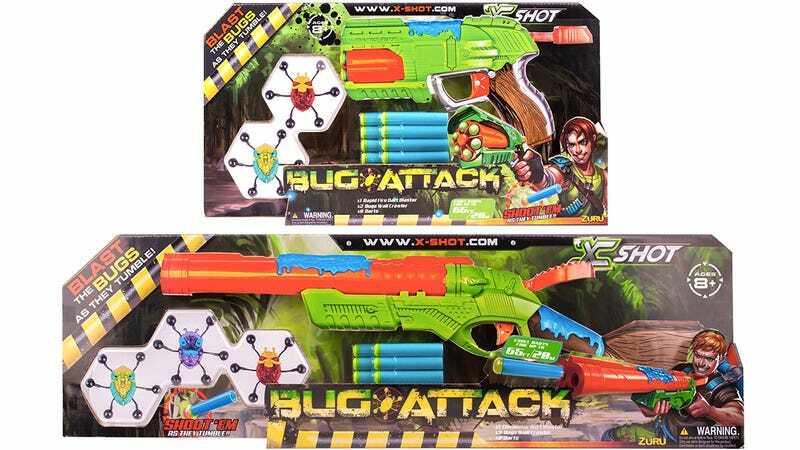 Most homes with a decent arsenal of foam dart weaponry probably have a 'don't shoot them at people' policy which will be a little easier to abide by with the X-Shot Bug Attack line, because kids are encouraged to use them to take out wall-walking bugs instead of siblings. Two Bug Attack guns were revealed to Blaster Labs: a $13 double-barreled shotgun called the Eliminator, and a $10 pistol called the Rapid Fire that both include eight darts as well as Zuru's Creepeez wall crawlers.